The Belgian artist Koenraad Dedobbeleer, who was born in Halle in 1975, and lives and works in Brussels, is in a way the museographer of his own work. 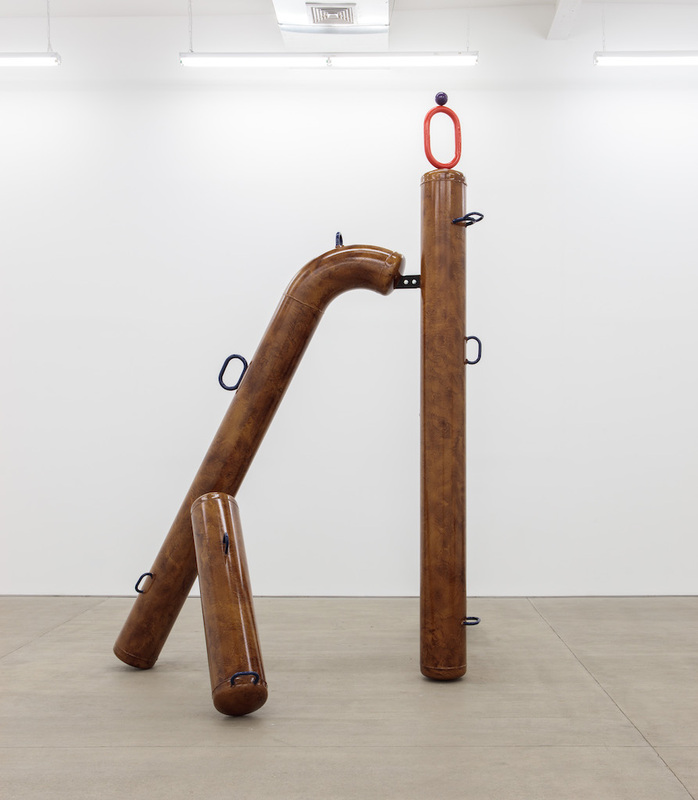 He makes sculptures which are fuelled by already existing forms, wavering between a functionalist architecture and a collection of tidies which the eye looks at without so much as a frown. At times, nay, often, references to art history are grafted on to this poetry of the daily round. So it is the objects themselves which seem to be whispering to the viewer to take them away with him and have an extraordinary experience, beyond the museum’s white, clinical walls. The exhibition currently devoted to the artist at the Wiels is titled “Kunststoff: Gallery of Material Culture”. With the sense of humour and self-mockery which is his trademark, Koenraad Dedobbeleer underscores the ambiguity of an art praxis consisting in creating new (art) objects in a world already saturated with them. In so doing, he stresses the systems with which he displays his works, be it stands whose form marries their function to the point of usurping the work itself, screens which at once hide and reveal areas of the exhibition, or slide projections juxtaposing reproductions of altogether similar works. These interplays of reversals are aimed at creating an indeterminate zone questioning the roles of author and viewer in the phenomenon of designating the artwork. The first floor is presented as a modern art gallery where you stroll among bowls filled with real fruit, natural stones placed on the floor, and the statue of a Greek ephebus mounted on a metal hanger. At the entrance, a display board warns us about the allergic potential of certain things in the show, and specifically fruit with shells contained in the front pocket of a huge mustard-coloured poncho, hanging on the wall—just in case a famished child equipped with a nutcracker might come and help themselves from the stores of a giant squirrel. Why not. The visit carries on in another room hidden by one of the screens—titled repressive tolerance—which intentionally blocks the entrance, and behind which we discover a certain number of surfaces painted green, like so many illustrations from a Mnemosyne atlas devoted to the issue of (monetary) value and the meaning of the art object in our outrageously consumerist western civilization. 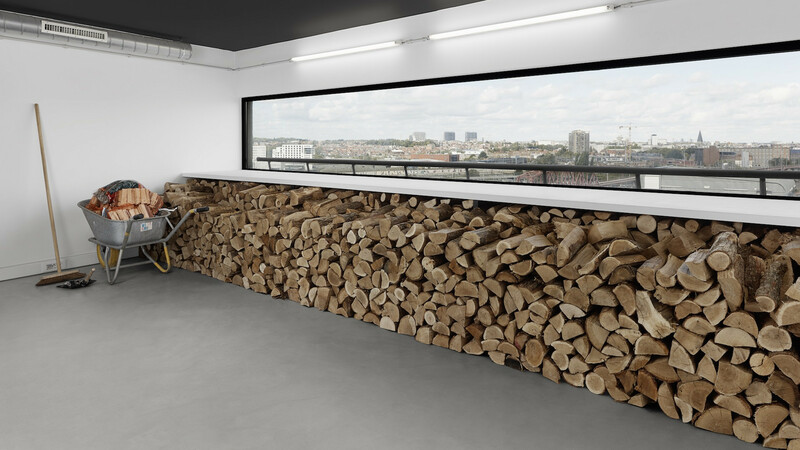 A set of pipes connected to the Wiels’s heating system also makes it possible to make a digression around the futile squandering of energy, while, on the top floor, we find a real wood stove, burning real logs, cut up and stacked by real watchmen. And for the curious keen to get too close to the stove to warm themselves up, beware of getting burnt by the metal! A whole section of the artist’s library is also there, with open access (only duplicates, let it be said), with furniture specially made by him, inviting visitors to contemplate and read by the fireside. And should one feel like a small pick-me-up, you can even help yourself to a coffee. To complete this setting, the partitions on the rear wall have been pierced to let light in and give access to a view of the building’s exterior and the city. If the installation causes smiles, it also raises the question of the need to re-introduce conviviality and comfort into contemporary art shows, which are cruelly lacking in such things. Koenraad Dedobbeleer, Faux Blonde, 2016. Spray-painted steel, enamel paint, stainless steel bolts, 343 x 226 x 305 cm. Courtesy Koenraad Dedobbeleer ; CLEARING, Brussels/New York. In many respects, Koenraad Dedobbeleer’s show invites criticism booing art for art’s sake and dedicated to initiated people. But the artist demonstrates such kindliness, mixed with mischief, towards the viewer that we cannot allow ourselves to bear him a total grudge. In a nutshell, all he does is lay a trap (in the form of a mirror) for the visitor; he also gives them the stuff of dreams: what live(s) do all these sculptures lead at night, when the art centre’s lights go off? Do they stop being works and become simple ordinary objects once again? Whatever the answer, the material condition remains a kind of repression of the collective unconscious: the more one stresses the discourse, the intent and the concept presiding over the creation of the work, the more one forgets its effective trajectory—from the studio to the exhibition venue—, the materials and the gestures which have composed it over time. It’s Only the Idea that is Permitted to Generate Form ironically reminds us of the artist in the title of one of his works. But we don’t get away so easily from the representation or the power of suggestion of the imagination: a copper-covered sphere, covered with hemispheres floating in a state of weightlessness in the air, with a cigarette at its top, will always look like a cowboy smoking a Lucky Strike. *The exhibition goes hand-in-hand with a monographic publication tracing the development of Koenraad Dedobbeleer’s activities since 2006, with an introduction by Zoë Gray, curator at the Wiels, an essay by the art historian Patricia Falguières, and a selection of exhibitions commented on from memory by curators and artists. A joint publication produced by Wiels, Koening Books, Kunst Museum Wintherthur and Kunstverein Hannover (which will also host the show in 2019). Image on top: View of the exhibition Koenraad Dedobbeleer, “Kunststoff – Gallery of Material Culture”, 2018. Photo : Tobias Hübel. © WIELS.